As an Australian, any interaction with a non-Australian tends to centre around kangaroos. Namely, can you see them on the high street or do you ride them to work? But without a doubt, the most popular question is a simpler one: where can I see kangaroos when I come to Australia? To put it simply, no we don’t ride them and the best place to see them in Australia also doubles as a ridiculously gorgeous Queensland beach that most tourists haven’t heard of yet. 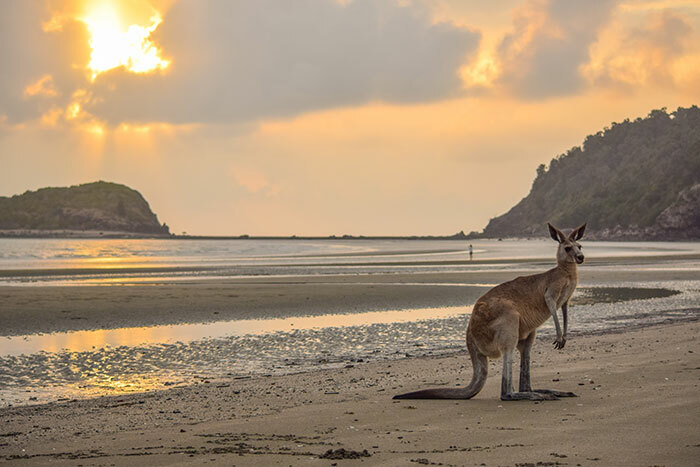 The magical beach filled with friendly kangaroos that we’re talking about goes by the name of Cape Hillsborough, and you’ll find it just outside of Mackay in Queensland. You can access the beach by car from Mackay - which makes for a great road trip through The Leap which is home to the breathtaking (and aptly named) That Sapphire Place, a collection of precious gemstones - via a 40-minute trip. So not only is the beach beyond cool, it’s also relatively easy to get to, which is always a win in my books! How do I chill with the kangaroos and wallabies? Now for the fun part - the Eastern Grey kangaroos and wallabies! 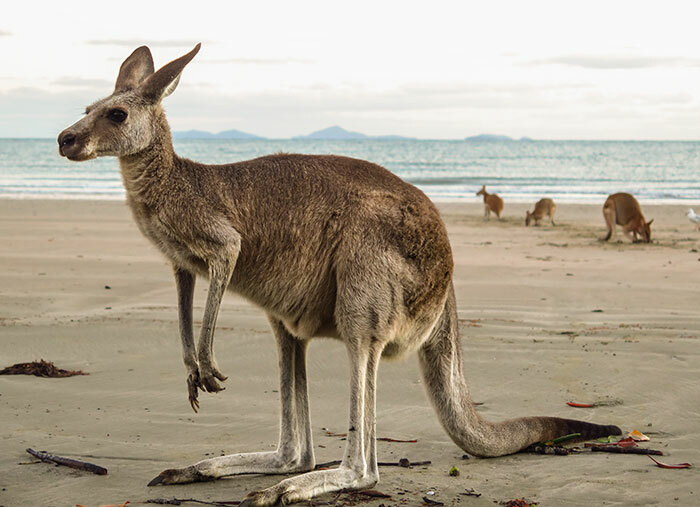 Cape Hillsborough’s Casuarina Beach is home to a friendly little crew of wallabies and kangaroos who frequent the beach each dawn and dusk to chow down on their favourite food that washes up on the beach with each tide - seaweed and mangrove seed pods, yum! 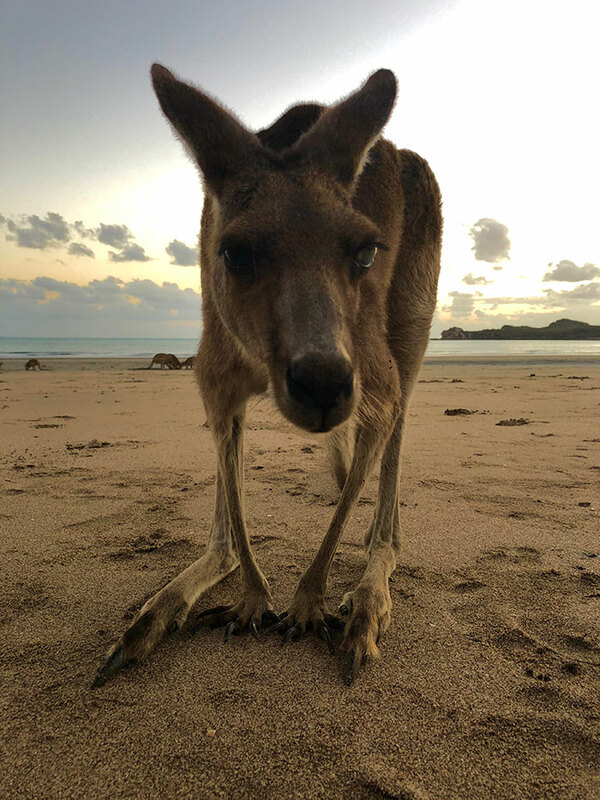 To see these friendly macropods all you need to do is be on the beach at dawn or sunset (although in my experience dawn is definitely your best chance to spot them), and that’s it! My tip is to book in a tour with Ranger Sam. Sam is a local who knows everything there is to know about the roos. Most importantly, she’s a pro at getting the perfect shot of the roos - check out her Instagram if you don’t believe us! Sam can also tell you how to make sure both you and the roos and wallabies are feeling comfortable and no one gets scared off by a selife that’s too close! Since you’ll be waking up at dawn, you’re going to want to be close by. My tip is to stay at the Cape Hillsborough Nature Tourist Park which is right on the beach. They offer camping sites and a range of cabins to suit those of us who aren’t so crazy about camping too. Plus, there’s a gorgeous range of walks around the beach and its headland to explore once you’ve visited the kangaroos, so you’ll never get bored. Ready to get up close with some kangaroos? Talk to one of our Travel Experts to book your tailor-made Queensland holiday.